What others should know: EVERY SINGLE pellets skirt was deformed in the tin, to the point where if you want to use the pellets you need to take a .22 domed pellet and press the head into the skirts to reshape the skirts. I had to do this to every pellet as they ALL were damaged,they are just so thin that they buckle under the weight of the pellets on top. What others should know: Good mid sized pellet. Things I liked: Testing different pellets in my hatsan flash 22, I found the jsb monsters and ultrashocks had groups the size of a quarter at 60 yds. There was little to no drop so no holdover was necessary. I did crank the power up a little bit on the hatsan hammer spring. Things I would have changed: Make larger containers with a break for volume so we get more pellets and you waste less containers! Things I liked: @ 50 yards My Hatsan Nova .22 easily groups 10 inside a quarter, on max power @ ~860 fps. just noob me laying on a pillow. Huge improvement over the original version. The original version grouped about twice this size. Things I liked: Arrived on time and in great shape from Pyramydair! My condor loves these pellets. Very accurate from 30 to 100 plus yard. What others should know: My condor with 24 inch barrel will break the sound barrier, I tune the power down using the ring-lock valve pin .166, I get average 1080 FPS at 65 FPE at the muzzle. Pest on the farm dont know what hit them. Things I liked: Lightweight ammo for Huben K1s. Things I would have changed: Screw on lid, bigger tins. What others should know: Supersonic in a Huben. Things I liked: Jsb always got the best pellets. This one even better than exact jumbo monster. I love it. What others should know: Make sure it can fit into your mag. Things I liked: Great shooting pellet in my Air Ranger. Shoots them at 930 FPS chronied and they group under 1 inch at 100 yards. Things I would have changed: Bigger cans to hold more ammo and screw top lid. What others should know: You need a very powerful gun to start with. The difference in velocity is over 100 FPS between a gun shooting the JSB 18.1 pellet at 935 FPS and the same gun shoots the JSB 25.4 at 820 FPS, both these chronied. Things I liked: A improvement over the old design! Accuracy was much improved, little over an inch. More consistant grouping. What others should know: Shooting a Gen I Mrod, with a single shot tray. Shot at 30yrds. Things I liked: Consistent quality. Fits the chamber consistently. High ballistic coefficient at .039. Things I would have changed: A quantity 500 tin would be convenient. What others should know: These shoot well in an Artemis Model 30. The barrel has a faster twist than a typical air rifle barrel twist, and a longer pellet therefore works best in this air rifle. Accuracy at 20 yards is excellent at 800 fps. I am getting 10 shot groups .075" center to center. A hollow point version would be interesting, but only if it keeps its already existing high ballistic coefficient. I was thinking more like a Crosman Premier 22 Hollow Point, which has a smaller hole, yet very functional, and wouldn't decrease the BC very much. like I already stated, they are made in hollow point. check-out the jsb 25.39 grain "ultra shock" hollow points. Things I would have changed: big tin please, at least 350 per tin. What others should know: always test different pellets out of your rifles, every barrel is a different world. Things I liked: Packs a punch in my all of my PCP's. they are made in hollow point. check-out the jsb 25.39 grain "ultra shock" hollow points. Things I liked: accurate tight groups at 50 yards through an Airforce condor at the lowest setting. Things I liked: Heavy, well formed, uniform & clean pellets. What others should know: If you have an airgun with the power enough to push these big boys, give them a try. Things I liked: Much better groups than the original design in my GAMO Coyote .22 cal. Great weight. No damage found on the skirts. Things I would have changed: Maybe 250 for the price. A larger size tin also like 500. And a screw top. What others should know: This was an excellent upgrade. These are accurate and pack a punch. Things I liked: These shoot very well in my Gamo Coyote .22 caliber. At 50 yards they group much tighter and they seem to handle the wind better than the original ones. The new design seems to make them much more stable. I highly recommend these pellets. Things I would have changed: Maybe at tin with more count and a screw on top. What others should know: You won't be disappointed in these pellets. If you tried the original design you will find these are much improved and give much better accuracy. Things I liked: The diameter and weight of these are very uniform. The pellets are tightly packaged in a small tin with a standard JSB pop-off lid. A small piece of cushioning plastic foam keeps them from rattling around. The quality of the pellets is quite high. No deformed pellets were found. Miniscule amount of lead dust in the tin can. My tin had 202 pellets. Nice! Things I would have changed: An option to purchase them in a 500 count tin. A darker black or grey color would be nice so my chronometer could "see" them better. What others should know: These shoot wonderfully well from my Daystate Huntsman Regal 30 FPE PCP air rifle. Ten shots at 25 yards all in a 3/8-inch hole. These load just fine in the standard Daystate rotary magazine. My Daystate Regal fires these at an average muzzle velocity of 714 FPS. I doubt multi color painted pellets would be in high demand. Things I liked: I have an AT44 long QE. Shooting these pellets at an average of 900 fps. This is the best pellet I have found for this gun. Wind doesn't seem to affect it. It is an excellent long range pellet. 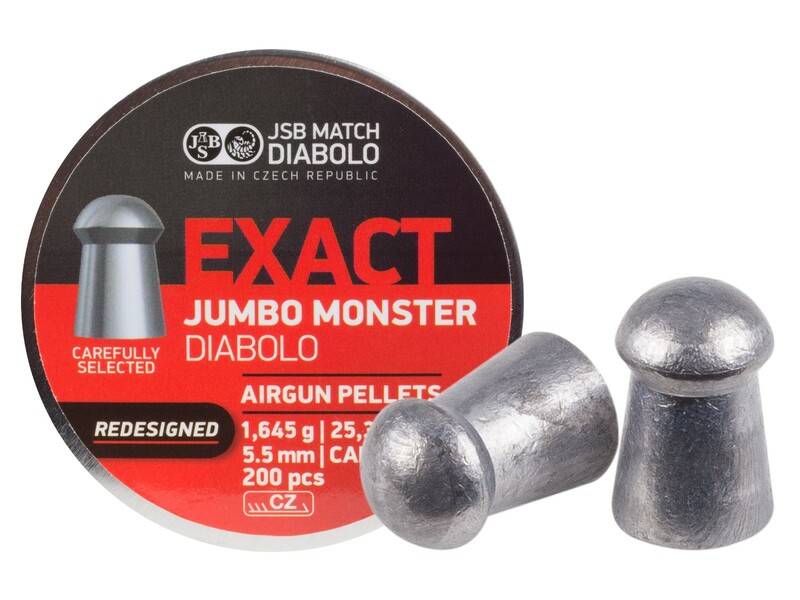 What others should know: The redesign is much better than the original monster pellet.